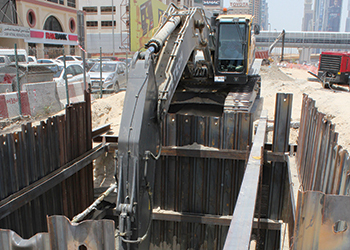 Detech used Volvo excavators on the project. Under the first phase of the project, Detech was engaged by the main contractor to carry out micro-tunnelling and the protection of existing 132 kV cabling, water main lines, sewerage rising main/gravity pipes, as well as communications services. All the utilities had to be relocated before excavation of the canal could begin in earnest. Phase One consisted of building two eight-lane elevated road bridges – allowing the longest road in the UAE – the Dubai-Abu Dhabi E11 highway (also known as the Sheikh Zayed Road) – to soar over the canal. These multi-span bridges, each 600 m long, 36.7 m wide and with a navigational clearance of 8 m, opened to traffic in July – but not before a considerable amount of modification in the vicinity of the project. The section Detech was working on was not without difficulties. For example, the proposed corridor already had several unmapped utilities running through it – while another required the sewage pipes to be sunk to an unplanned depth of 10 m (32.8 ft). “If you hit unexpected situations or bad ground structures, you can be in trouble,” says Halit Onur Kutlu, one of three partners in the company and who is responsible for equipment decisions. Given the high profile of the project, Detech decided that it needed suitably high quality machines. After an initial six-month trial renting two Volvo excavators, the company has built up its fleet of 70 machines which now includes 12 machines from Volvo. These machines were supplied by local dealer Famco and span various size classes, including EC480D and EC300D heavy-duty excavators, L120F wheel loaders, DD15 double drum compactors, BL61B backhoe loaders and MC60 skid-steer loaders. The larger Volvo excavators (EC300D and EC480D) are specified with longer booms, allowing excavating at depths of up to 12 m. Both are also fitted with hammer hydraulic lines. Given the extreme dust and temperatures of the work site – which can reach in excess of 50 deg C – the machines are also fitted with tropical kits that include oil bath pre-cleaners. Supplied with a service contract that is being delivered by Famco, the machines worked at their optimum levels. “Fuel consumption is very important, as is maintenance, rapid parts supply and technical help. It’s also important that operators like using the machines, and the Volvos are proving very popular,” says Onur.